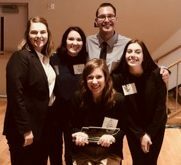 Each spring, Belmont sends its junior social work majors to compete in the annual Day on the Hill event, which allows a chosen representative from the group to present a summary of a bill that is on the Tennessee Legislative Assembly Agenda. This year, under the guidance of Dr. Jenny Crowell, instructor in the department of social work, the team won the event. The competition consists of social work students from across the state. The Belmont group, with Lauren Barnhart as their speaker, discussed the importance of the bill the allow the creation of recovery high schools. The bill was recently signed by the governor.